Relentless opportunists, third-rate academics, carbon-market scam artists and peddlers of catastrophic prophecy are refusing to give up on the global warming scam. Once the “elite” discovered the road to personal wealth and power with the creation of a constant state of fear scam, these greedy, corrupt, self-serving, lying con artists, most with impressive credentials, and political power, refuse to back down. They just don’t get it – the majority of Americans don’t embrace the lies. They figured it out. When scientists, or those claiming to be scientists, concoct evidence, homogenize data, refuse to expose their scientific data to verification by the wider scientific community, or refuse to engage in real debate with their peers, or skirt contra-indications to an improbably hypothesis, they have an ethics problem. When they actively collude to conceal inconsistencies in their own findings, and misrepresent evidence, or invoke the authority of consensus and then exaggerate and misrepresent the scale of that consensus, they have ethical issues. In a recent report for the Democracy Fund Voter Study Group, center-right strategist David Winston conducted a cluster analysis to identify voting blocs by their issue priorities. Based on large-scale survey data, the study group identified five distinct clusters of voters. What Winston discovered was that environmental and climate issues were only in the top two of voter concerns for Democrat/Independent Liberal Elites. In contrast, both conservative groups and the moderate group each placed the economy within their top three issues whereas the Democratic Leaning Working Class placed it fourth. The Elite also differed from other voting groups and the overall electorate in terms of the issues on which they placed less emphasis. Terrorism, taxes, religious liberty, and the budget deficit were all bottom-tier issues for Elite but fell within the middle or at the top end of the spectrum for the rest of the groups. Only one of the top five issues for the overall electorate was a top-five issue for Elite as well and that was health care. The Liberal Elites constitute only 13% of the electorate; by comparison, the Democratic-leaning blue-collar voters represent 27%. It is also fair to note that the Liberal Elites are whiter than the overall population, and much whiter than Democrats as a whole. They are also more formally educated and considerably wealthier. The fact that they are out of step with the rest of the American electorate on the urgency of climate change does not necessarily mean they are wrong, but it does raise a political problem for the left in general and the Democratic Party in particular. The overall truth is that since 1989 there has been no significant change in the public’s concern level over global warming despite the most expensive agenda driven campaign by government agencies, welfare-sucking corporations, public schools, universities, celebrities, well-funded radical environmental groups, left-wing think tanks and the Democratic party. 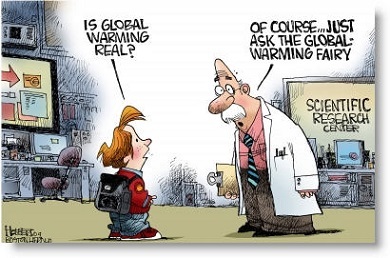 Global warming has become nothing more than leftist malware infecting economic growth. In spite of all the left-wing shrieking, the aggregate emissions of pollutants has been in decline for the last 35 years thanks to private technological advances in efficiency brought to you by free market competition, not solar or wind farms. Hot air has failed the Democrats as a solution to their climate change problem. Doing the same thing over and over while expecting a different result may not be the definition of insanity, but it still seems like bad politics. Source: The Liberal Elites Driving Climate Change Hysteria Are Hurting Democrats’ Electoral Chances, the Federalist. You can read the article in full at this link.